"In the Hartman blind, the inventor has succeeded in devising a sliding blind which can be readily attached to the ordinary window frame, and readily removed there from." The wood blind slides in the window frame, and remains in any desired position. The wood blind is held in place by means of steel springs (concealed from view), as shown in Figs. 1, which exhibit the appearance of the wood blind in use, and in various positions. They are made in three or more parts or sections, each moved independently of the other and, according to the size of the window to be furnished, in two, three or four panels in width. The sliding feature of these blinds has obvious advantages over the old form of hinged blinds, in that it avoids the unpleasant rattling which most of us are familiar with, and the tangling with the curtains, while it does not interfere with plants or flowers on the window sills. The sliding feature of these wood blinds has obvious advantages over the old form of hinged wood blinds, in that it avoids the unpleasant rattling which most of us are familiar with, and the tangling with the curtains, while the wood blinds do not interfere with plants or flowers on the window sills. These blinds are much less liable than the old style blinds to get out of order, and that they will in consequence outwear several sets of the old form. To this should be added the advantage that the Hartman blinds may be readily adapted to any ordinary window frame, and adjusted in working order in an hour by any mechanic of ordinary skill, and removed in a moment if necessary. To adjust in position a set of the old style hinged blinds is about a half days work. To state the case briefly, the Hartman blinds are claimed to have all the advantages of the old-style hinged inside blinds in respect to elegance of appearance, without any of their in conveniences. The evidence on this point will shortly given. 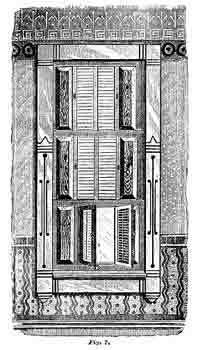 Where the window frame admits of it, the wood blind guides are carried entirely down to the floor, so that when desired the wood blinds may be neatly stored out of the way below the window sashes, and either in front of the panel-back, as shown in Fig. 2. 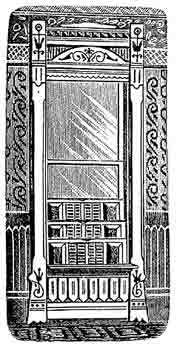 In regard to construction, the essential features will be understood from the following description: Where the window frame admits of it, the blind guides are carried entirely down to the floor, so that when desired the blinds may be neatly stored out of the way below the window sashes, and either in front of the panel-back, as shown in Fig. 2, or behind it, as shown in Fig. 4, which represents the blinds thus neatly stowed away in a pocket, with the panel-back in front of the blinds. 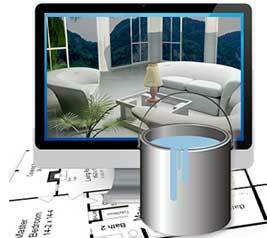 In this case, a hinged lid, or sill, is provided, which, when the blinds have been lowered into the pocket, closes it up. This is shown in section in Fig. 3, the dotted curve exhibiting the movement of the lid in opening or closing over the aperture in the panel-back. Figs. 3 and 4, for example, exhibit the above-named arrangement of a receptacle behind the window panel, into which the blinds may be stowed out of sight and covered with a suitable hinged sill. The blinds in no way interfere with the simultaneous use of the ordinary window roller-shade, which may either be adjusted neatly between the sashes and the blinds, or, if so preferred, entirely inside the latter. Quite a variety of plans may be used to attach the blinds to the window frames. Fig. 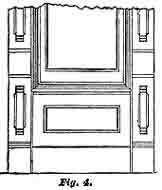 5 represents one of the many ways of constructing a window frame for the use of this blind, when the frames are made new, showing the location of the guide-way for the blinds, so set back on a sub-jamb as not to interfere with the taking out of the sash, and thus retaining the usual sash stop in the proper place. It is, however, not necessary to construct special window frames for the reception of these blinds, as they can readily be placed in any ordinary frame, as the guide-way can easily be attached to the jambs inside the sash, and the blinds fitted to slide in them. Fig.7 represents a perspective view of a new style of wood blinds, which may present certain conveniences. The wood blinds may be described as follows: It is termed the “Novelty,” and the wood blind section is made in the usual manner, but the inside divisions of the sections are made to swing on hinges, so as to open and shut the wood blinds at pleasure. The section slides up and down in connection with other sections, of which it constitutes a part. This swinging may be applied also to any of the other styles of wood blinds if desired. 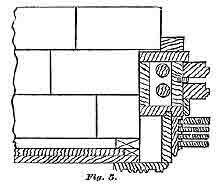 To remove the wood blinds from the window frames, it is only necessary to press each section sideways against the springs, flattening them far enough to enable the stile on the ether side of the section to pass out of the groove on that side, when the section is easily withdrawn; by reversing the operation, the section is replaced.